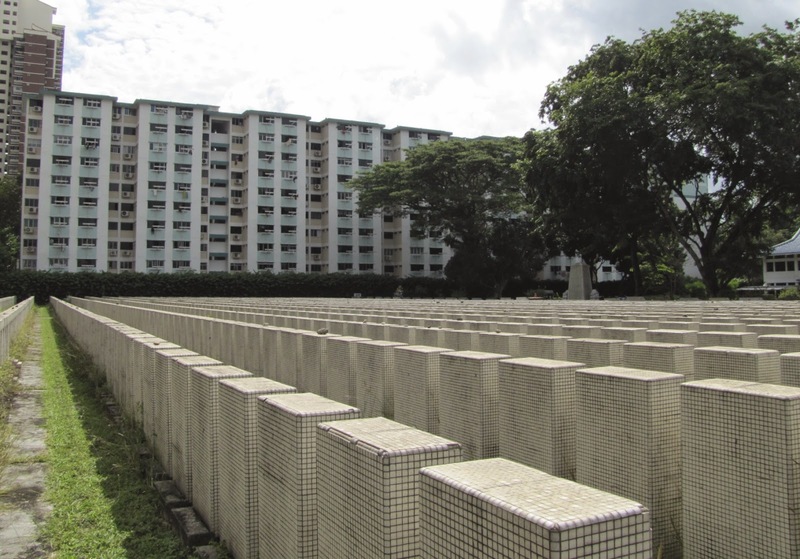 The same day we visited Istana Woodneuk ( http://www.singaporetales.co.uk/2014/08/istana-woodneuk.html ) we had all met at Commonwealth MRT station and took a quick 5 minute walk to the threatened Yin Foh Kuan cemetery belonging to the Yin Fo Fui Kun clan. 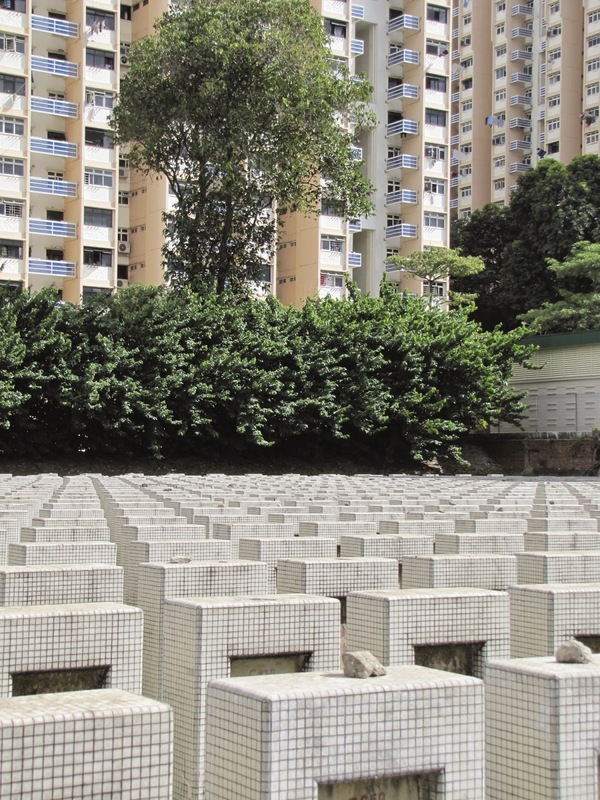 Nestled between towering HDBs, a petrol station and a small industrial area peacefully lies this Hakka cemetery, you will have probably spied it as you passed by above on the train. We entered and turned left and first made our way into the red roofed Wu Fu Tang Ancestral Temple built in the traditional Chinese style and fronted by a semicircular fish pond. 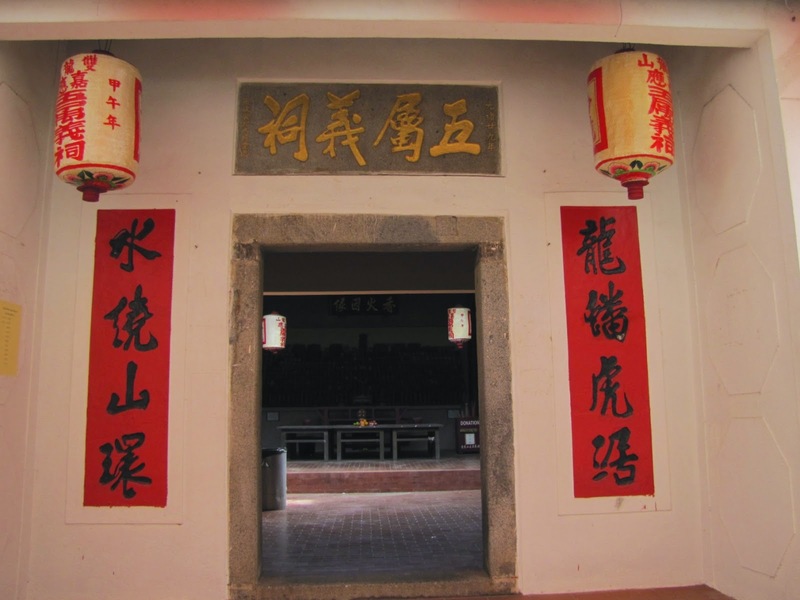 We were visiting during the 7th month festival (hungry ghosts) and the frontage of this temple was masked by a red and white canopy so photos don't really do it justice. It was built in 1887 and is also home to ancestral tablets, some of the older urns and some newer. 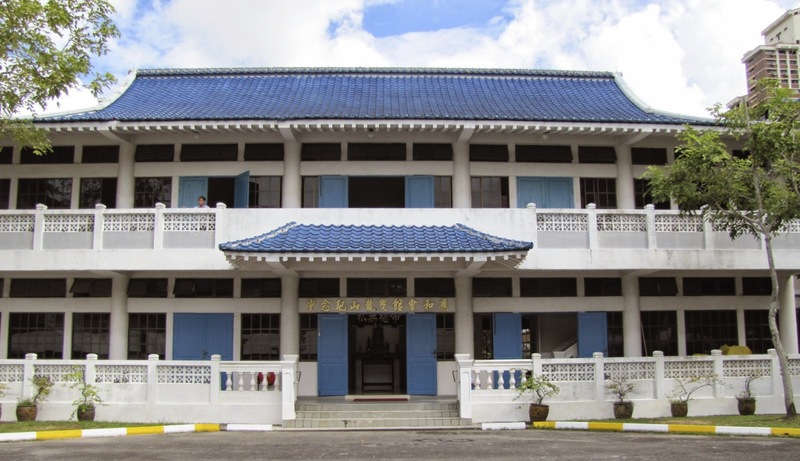 To the right sits the larger and much newer blue roofed Shuang Long Shan memorial hall, home to the columbarium and built in the 1970s. Ancestral tablets. The one covered in a red cloth is not yet deceased. 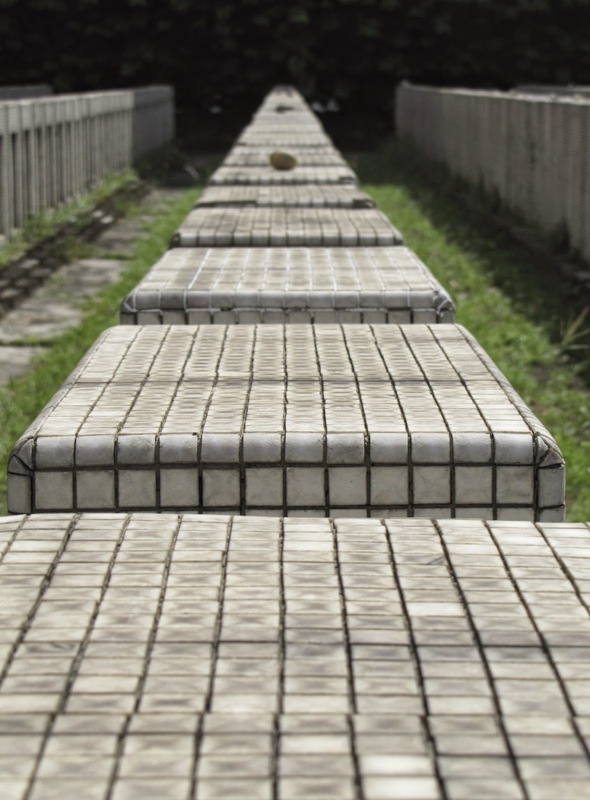 Ying Fo Fui Kun is also known as Shan Wu Shu and means "Double Dragon Hill' being built on a hill, there was once also another cemetery nearby called Yue Shan Ting which was built on a much larger 143 acre site. Yin Fo Fui Kun originally cover 100 acres but is now down to under 5. 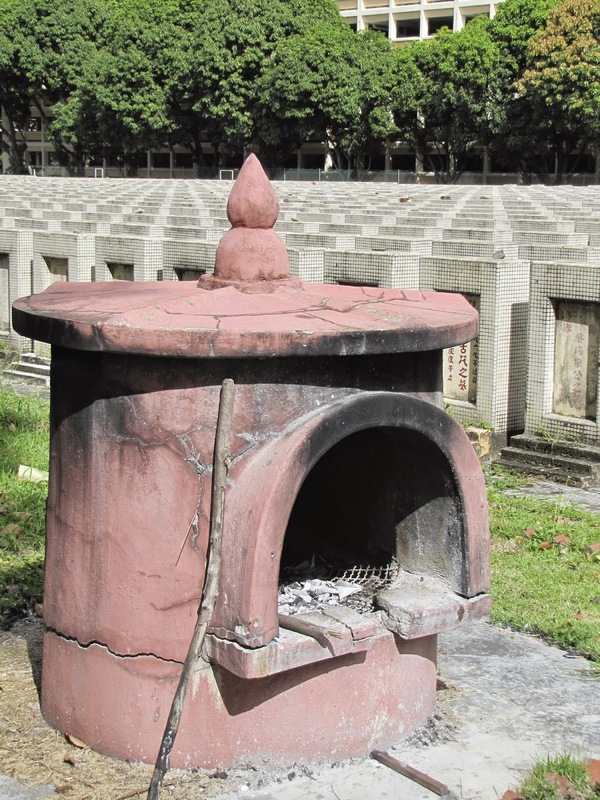 Over time land became scarce in Singapore and cremations became more the norm and were encouraged. 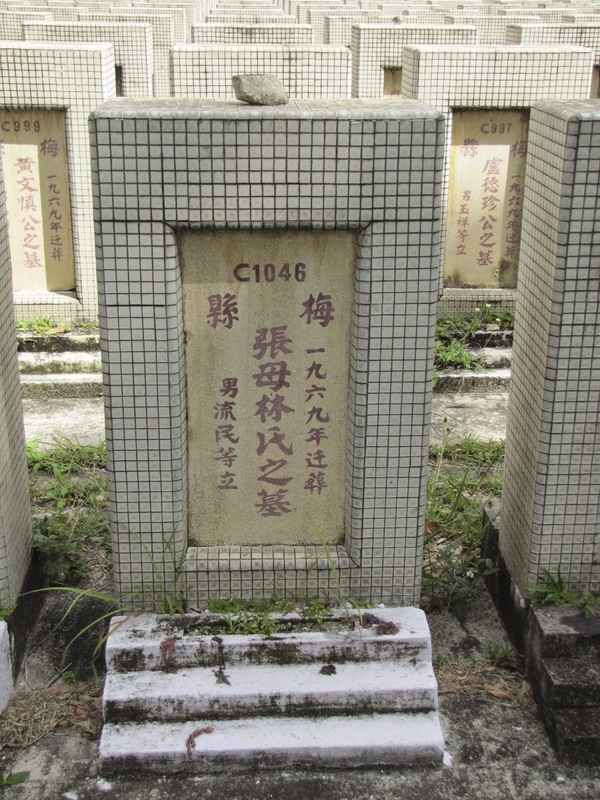 In 1969 the Singapore State purchased the land for residential use but, as this is the only Hakka cemetery in Singapore they agreed to the clans request to keep 5 acres and allowed almost 3,000 graves to be exhumed, cremated and re interred in urns and reburied. This explains the close lines and the fact that all the graves are identical as they were placed here at the same time. The graves are in 65 rows, all equally apart, identically covered in plain mosaics with only a couple having the photo of the deceased. In front of these rows sit 12 larger more ornate graves, these are 12 actual graves and not cremations. Clearly people of some significance. 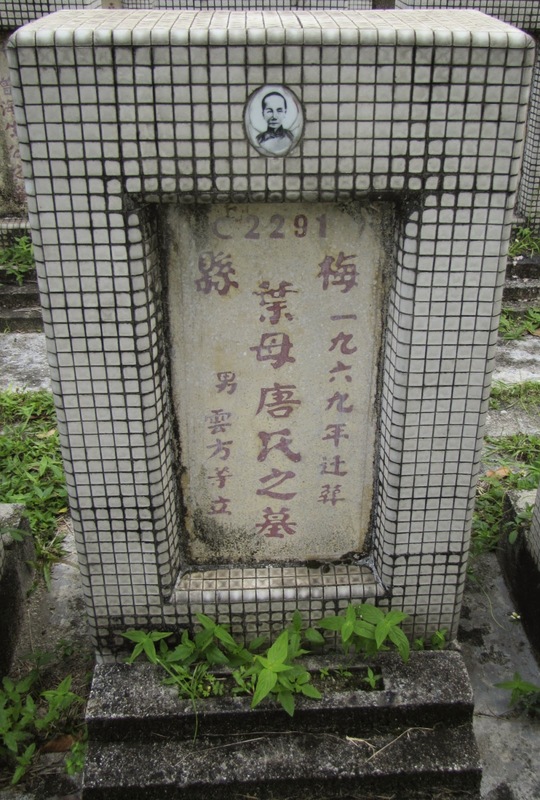 It's strange to see Chinese grave markers like this as I have become accustomed to seeing the more ornately decorated and designed graves such as you can view at Bukit Brown Cemetery. The headstones you can see with a stone atop denotes that they are still cared for and someone has visited them recently. Whilst looking around the cemetery we saw an "uncle" waving to us a number of times, shirtless and shoeless, we waved back. We returned to the temple and found "uncle" and learnt he was the caretaker of the site and although he didn't speak any English he wanted to tell us about this place. So through sign language and scribbles on a paper plate he tried to tell us his and the sites story. His name I have found out from the internet is Ah Koon. From what we could understand his parents "mama, papa" are not here as he couldn't afford to pay the prices but I'm not sure if we fully understood him correctly, although he tried to explain this to us a number of times. His father had been the caretaker before him for 20 years and he himself had been here since 1982 and he was now 58 years old. 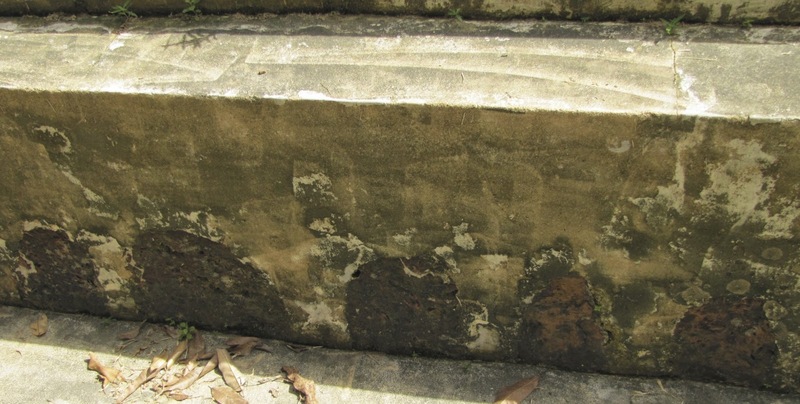 We believed he explained that many of the graves no longer have urns there as there is a high price to keep them there and when this happens they are removed and placed in the ancestral hall - or at least that's what we think he was explaining. 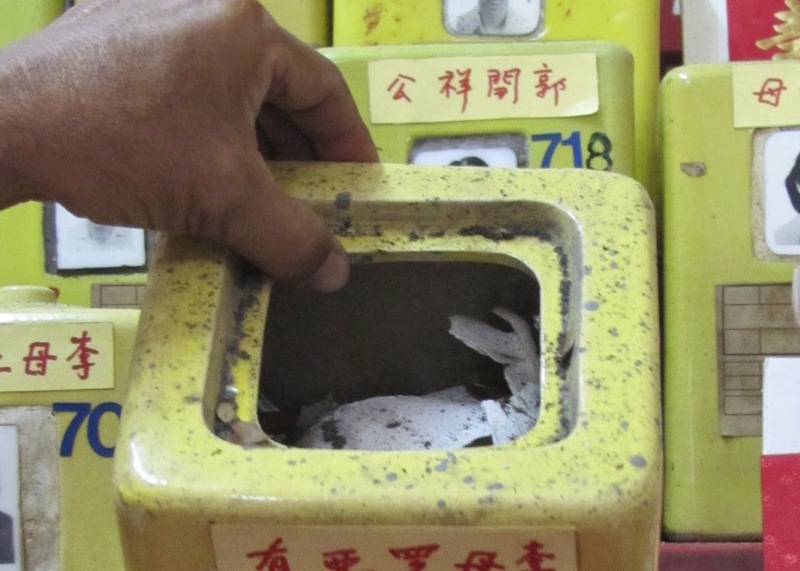 Certainly he was saying if they couldn't pay for the urn and up keep of the urns the remains are finally disposed of. He even showed us the insides of one of the urns, we were slightly taken aback! He was a friendly passionate uncle who was so keen to "talk" to us and apologised for not speaking English - well we don't speak any Chinese! Afterwards he took outside and showed us, in the retaining wall behind the ancestral temple, 5 stones which represent the 5 elements. Earth, Wood, Metal (although the sign said gold) Water and Fire. 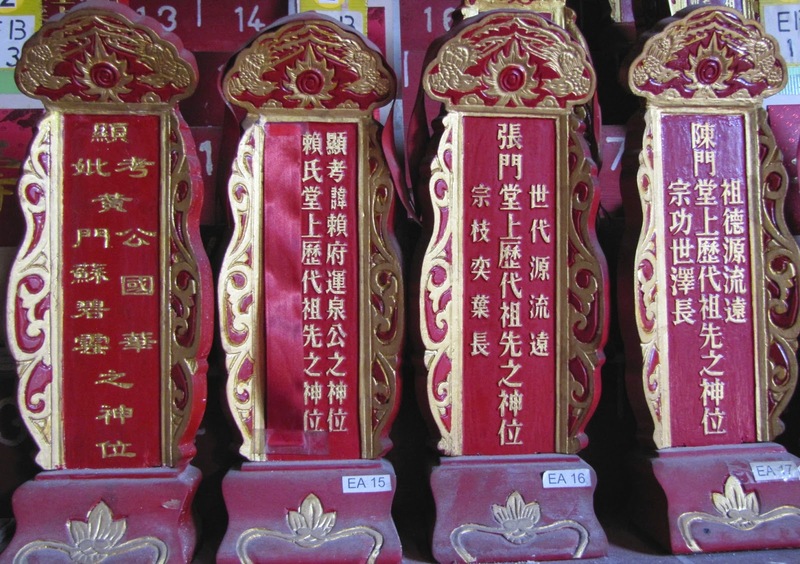 These are to keep the evil spirits away. The 5 magic stones, representing the 5 elements. We passed through the blue roofed memorial hall, home to the columbarium. To be honest apart from its architectural Chinese design it was nothing out of the unusual for such a building. Shuang Long Shan memorial home. The newer building and home to the columbarium. There have been news stories abounding for years that the site will be sold and, just this year, its been reported in the news that the clan are thinking of exhuming the remains from under the stones and placing in the columbarium, and that the land will then be used for a community centre for the clan members and the community. The caretaker though told us that nothing will happen until 2065 - I wonder how much he knows or if this is indeed true - lets hope so, for you won't see another cemetery like this. 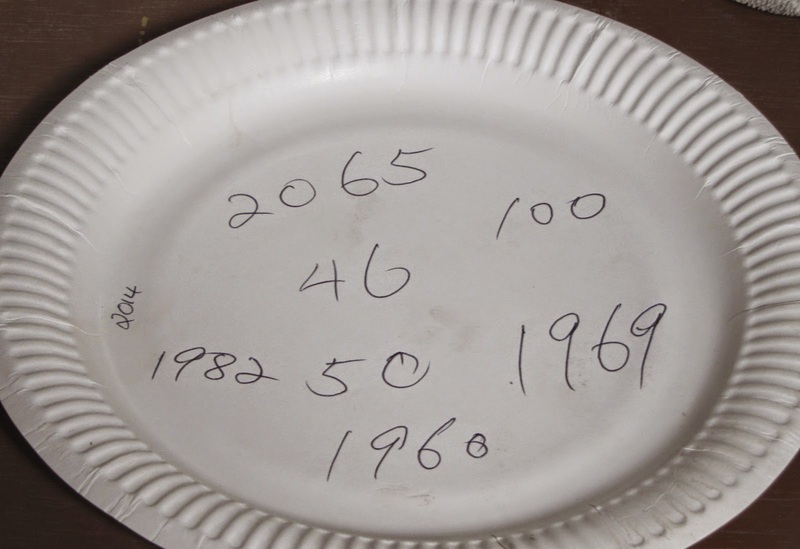 The infamous paper plate where the caretaker tried to explain so much. A later picture of this shows all our birth years - not giving these away!!!! The largest of the 12 actual graves and the biggest, clearly people of some importance. The ants were enjoying this recent offering. One of the very few grave headstones which showed a picture of the deceased.